Once you have installed the GroupMail Outlook Toolbar it will show under the Add-Ins in Outlook. To Add a Recipient to your GroupMail Group click on the “Add to a Group” button. The Email Address and Name Fields are populated, you can edit these fields if you wish before adding the recipient to your Group. Then simply ‘Map Recipient Fields’. 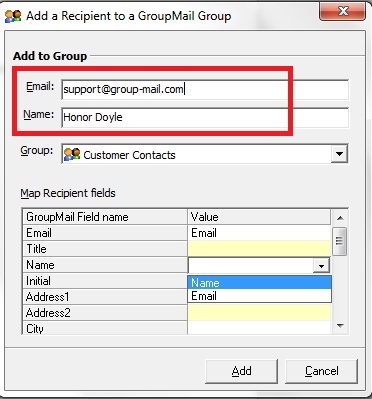 In this example Email is mapped to the Email Field in the Group and Name to Name from the drop down list above. You can then select the Group that you would like to add this recipient to. All GroupMail Groups are available in the drop down menu on the Groups Field. Select the Group you want to add this recipient to and then press the Add Button. If you open this Group in GroupMail you will see that this recipient has been successfully added to it. If you want to delete a recipient from a Group through Outlook, you can click the “Delete from a Group” button. Now you can select the Email Address to Delete and the Group to delete it from. There are three other options on this screen also. 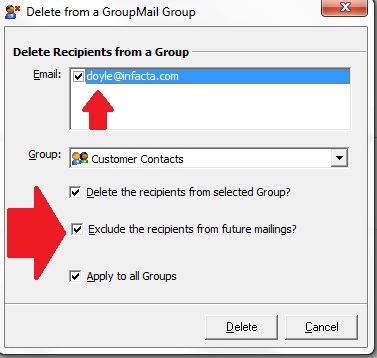 Delete this recipient from the selected Group will remove the recipient from the specific Group you have selected. Exclude this recipient from future mailings will add the recipient to the GroupMail Exclusion List. Other things that you can do using the GroupMail Outlook Toolbar is Launch GroupMail, Create a New GroupMail Message or Forward a Message to your GroupMail Group by simply clicking on any of these icons. Interested? If you would like to add a GroupMail Toolbar to your Outlook application, upgrade to the GroupMail Business Edition today.